Helo Dave, thank you for the Marine equivalents. There are only a few MVK awardings to Marine soldiers. I am only aware of three ships with a Bavarian connection Bayern, Prinzregent Luitpold and Von der Tann. Nice collection. The green pins with parts of a bird are awards for a special traditional competition, called "Vogelkönig". see this link. If you seperate one part of this wooden bird, you win the special pin. In your collection are several kinds of shooting pins of traditional and sporting competitions. I think all are shooting pins. Very nice and rare Picture. A MVK second or first class without swords. The MVO is a early Hemmerle with golden medaillon. The MVO is a Hemmerle, but I cant see if it is a golden or a silver guilt medaillon. So I need the backside of this award. I think the MVK is from another relative. What is written at ancestry about the Landwehr-Leutnant? What's in the box ????????????? Jäger in the house! Very nice grooping. Is that the treasurebox of the whole family? I think two or three owners. Very nice. This is a late production of Hemmerle (1918) with silver guilt medaillon. I have never seen blue paper. Normally this cross was in a red paperbox. 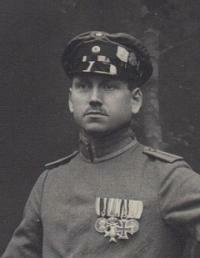 The first class was awarded to the rank Feldwebel-Leutnant.